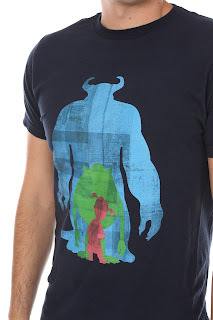 Over the past year or two, Hot Topic stores have released an impressive collection of exclusive Disney·Pixar merch. I've grown super fond of their t-shirts and tend to get many of them that catch my eye. 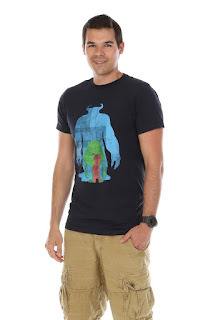 One of the latest releases, and probably one of my favorite Pixar shirt designs of all time, is this fantastic Monsters Inc. "Monsters and Me" tee! This was released pretty recently. I absolutely love the very minimal, textured graphic on this shirt featuring Mike, Sulley and Boo. I would actually love this on a poster! As with all the Hot Topic tees I've purchased, this is a quality, comfortable, soft and nicely fitted shirt- just how I like them. If you're a fan of Monsters Inc. and want to wear it proud, then this is the shirt for you. You'll never find another one like this. Head over to HotTopic.com to purchase HERE, but hurry before they're gone. Once they're out, shirt designs rarely come back. Thanks for dropping by! Be sure to check back daily for more from my personal collection of Pixar merch and memories.